Are you in doubt and don’t know what exactly you want to order? Check our Best Sellers category - so many people trust us and order cool Naruto & Other Anime Merchandise only at our store! Here you will find the most sold items of good quality that will help you to create a great anime look. If you consider yourself a true ninja from Konoha, then show your pride for the village! Shop for Konoha-themed merch now! Grab your cool Konoha Symbol ring for $0 and pay only for shipping! 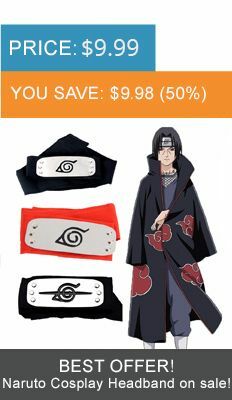 What about Naruto Ninja headbands? We have all of the types of headbands! If you are a fan of Akatsuki organization you will definitely like our best Akatsuki hoodies and jackets or Akatsuki cloaks! Become an Akatsuki member with cool anime-themed clothes and accessories! Among our Best Sellers you will also find merch from other popular anime series such as Attack on Titan, Bleach, Death Note, Dragon Ball, Fairy Tail, Full Metal Alchemist, One Piece, One Punch, Pokemon, Sword Art Online, Tokyo Ghoul and Yuri on Ice! Your Search for Anime-themed Merchandise ends here! How do you like Hayao Miyazaki anime? We have cool merch dedicated to Howl's Moving Castle, My Neighbor Totoro, Princess Mononoke and Spirited Away. With the best prices available, you are sure to get value for your money. Naruto and all your favorite characters from other famous anime will become much closer - our Hokage webstore guarantees!